After seven years of contentious debate, the Atascadero City Council approved the Wal-Mart project in 2012. A group of citizens then filed a lawsuit, but judges ruled against the suit in both the San Luis Obispo and appellate court. The planned Wal-Mart will consist of 123,000 square feet of building space and a 6,500 square-foot garden center. The store will be located at the southeast corner of the intersection of El Camino Real and Del Rio Road. Previous plans have indicated the Wal-Mart will employ about 250 people. It is expected to generate about $580,000 a year in sales tax revenue. Wal-Mart recently submitted plans for grading and roadway construction. Permitting for construction is not yet complete, but workers could soon begin making drainage improvements, constructing a parking lot and preparing the building pad on which the store will be constructed. 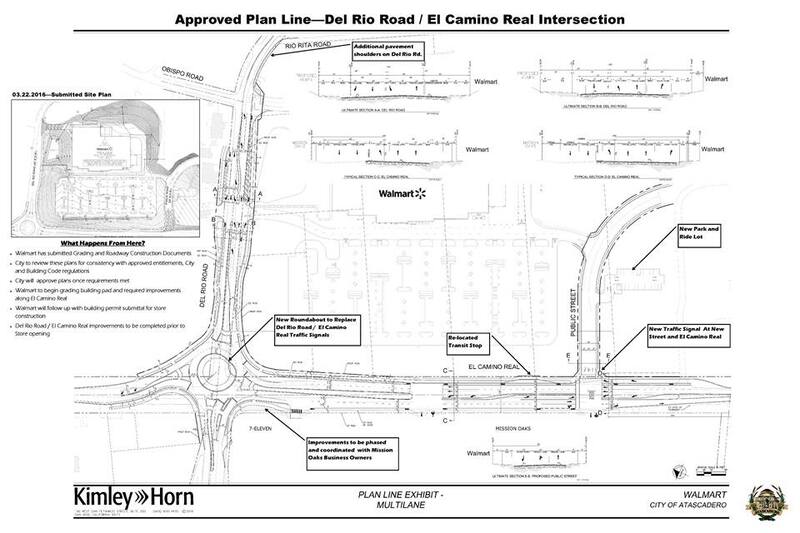 The company is making separate plans for off-site road improvements, including a roundabout at Del Rio Road and El Camino Real. Wal-Mart and Atascadero are expected to share traffic mitigation costs, but it is unclear if the city has the funds to do so. City officials hope the store will open sometime in 2017. Well after over 10 years the business climate is quite different than it was back in 2006-7 when Atascadero was in the heat of battle over the idea of a Walmart Super Center in the Quaint little town where everyone you met has lived there their whole life. Back in 2007 the starting wage will be half of what it would be if Walmart opens in say 2018. Lets get real Atascadero, Walmart is keeping this option open and has all but declined this project after a huge waste of everyone’s time. This whole spectacle has spanned the overlook of 3 US Presidents, my kids going from Elementary to College, and a complete cycle of economic boon bust and boon. Walmart Shot the Plot, they had a good chance to do well in 2008 to 2013 heckwho knows if they would have had it up by 2008 it might me a blighted building fullof homeless people who are cooking a fish caught from Atascadero Lake now that the water is back. At $15/hr for the new minimum wage….I will just buy everything from out of State Tax FREE BABY over the internet. Let the Government Hacks eat Cake. Not really, you still owe the tax to our state for your purchase. More importantly it shows everyone that you do not feel the need to pay your fair share and want others to pay your shortfall. We will keep this in mind when you complain about the quality of service. Does the hack harbour master like cake? I covered debate on this store well over 25 years ago. What’s scary is what prices will be like when the minimum wage goes up to $15/hr after five years. Then, even the affluent will look to saving at Wally’s. Don’t worry the robots are coming, no matter the minimum wage.